Peppercom's business analysts serve as traffic cops at the crossroads of business, media and public perception. The New York Times recently reported that the Obama administration would seek to limit offshore tax havens that have historically padded the wallets of multinational companies and wealthy individuals. The measure to do so would surely be music to the ears of Democrats and taxpayers alike, and scores of critics of hedge funds and corporations. Let’s put those tax breaks in context. The top corporate tax rate was 35 percent in 2004 (the most recent year the data is available) according to the Treasury Department. American multinationals paid far less. The tax bill on $700 billion in income generated overseas was $16 billion. That’s an effective rate of a paltry 2.3 percent. The new proposals would seek to fix this quagmire. In short, they would impose a greater tax burden on U.S. multinationals, and have the greatest impact on companies with large overseas contingents or global subsidiaries such as Microsoft, Pfizer, and Procter & Gamble. According to the GAO, 83 of the 100 largest American companies have subsidiaries in tax havens. Citigroup alone has 427 subsidiaries, followed by Morgan Stanley (273), and Procter & Gamble (83). The NYT ran a lengthy piece on Sunday detailing Moody’s failures on mortgage securities. Nothing new, but a case study on how and why this business needs to be overhauled with no one watching the watchdogs. My favorite line is where Moody’s changed an issuer’s ratings “even though no new and significant information had come to light.” Huh? Unfortunately, for investors, all of the criticism comes too late via e-mail trails dating to 2000 and former executives. It would seem that with Moody’s silence thought leadership is there for the taking - for someone like an S&P that is pushing its new initiatives. But neither will likely take the lead, since a 50-50 split of the revenues in this business is still a lot of money. 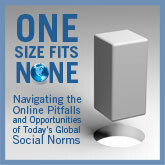 Click to read PepperDigital's series on the pitfalls and promises of global social media. Everything on this blog is the opinion of the authors and does not necessarily represent the views of Peppercom or its clients. Some posts may contain references to businesses or people that Peppercom or its clients work with or have worked with, and in such cases we make an effort to point out those connections in the posts. We also may choose not to write about subjects or events that may relate to or affect Peppercom clients.